You will find a variety of applique designs here. An applique tutorial comes with each design set. Hint: I always recommend a fusible adhesive backing when stitching applique designs. It make ithe fabric easier to trim, it keeps the fabric from ravelling as much and when you are finished and press the design, it will adhere it to the base fabric so it will be less likely to pucker and bubble. 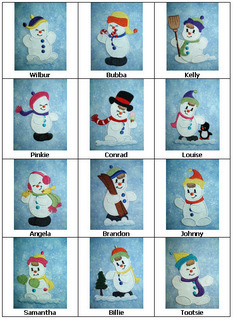 These Cute Snowmen designs come in a variety of ways but the combo set is by far the best deal. Check it out. 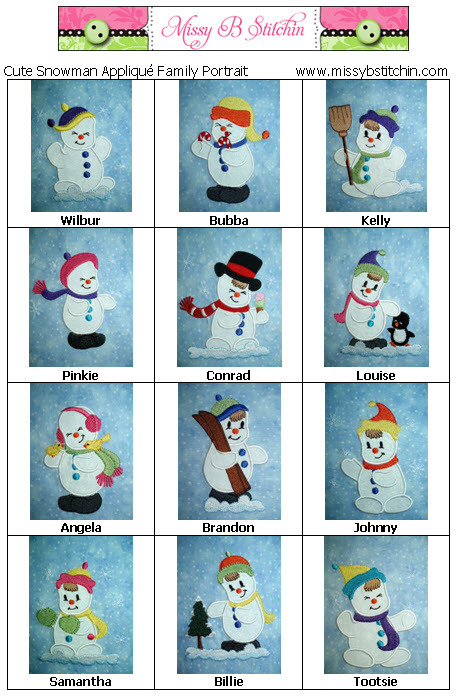 Cute Snowmen combo set, click here. <?xml:namespace prefix = o ns = "urn:schemas-microsoft-com:office:office" />ALL sizes, click here. 4" x 4" size, click here. 5" x 7" size, click here.